This is a fairly large article, so a list of contents is appropriate to know what is covered. With plenty of pictures (100 plus) peppered throughout the article, my hope is that a viewer's interest level should be maintained. To preface, this article is neither meant to be a product review nor a comparison of different brand products - except in a limited context. That said, the information presented herein, including the installation of the SD70's detail parts, is of value for those that are not concerned with just Aristo products. The USA Trains brand SD70 6 axle loco is my first non Aristo-Craft locomotive model. As is the case with Aristo 6 axle locos, all axles of the USAT SD70 are driven - albeit with a remarkably different design. I was enticed to get the SD70 as the newer USAT production runs of these no longer include traction tires. This assures wheel slip in the event of too much load - thereby, preventing potential motor damage should the loco otherwise stall when pulling heavy trains or if in a consist of other Aristo-Craft brand 6 axle locos that operate at a much slower operational speed per applied voltage. I realize there is some loss of pulling ability without the traction tires, but I much prefer the failsafe of wheel slip that is more conducive to my operational preferences. Since my core prototypical railroad of interest to is model Southern Pacific, I chose to get the USAT SD70 in road numbers 9812 and 9813 that are of a production run devoid of traction tires. For those not too familiar with SP's SD70s, it is to be appreciated they were SD70Ms (wide cabs - DC traction) and not SD70MACs (wide cabs - AC traction). SP had acquired 25 of the EMD SD70Ms (numbers 9800 - 9824) between June and August of 1994. 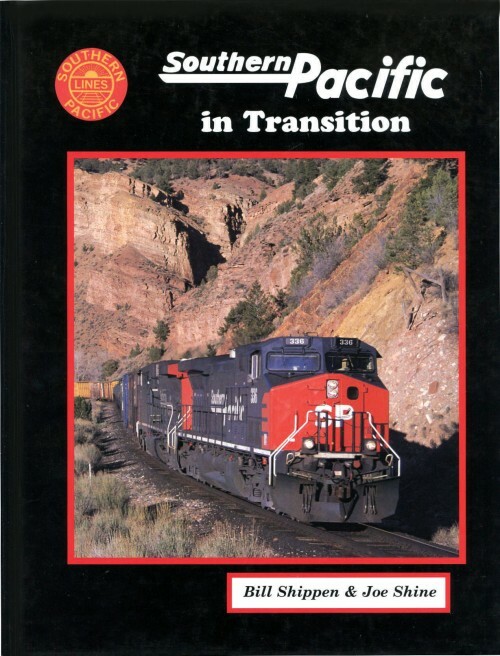 From looking at several books specializing in SP, they appeared to often operate them in pairs - sometimes with additional loco/s being the SD40, SD45, or GP60. They did not appear to operate them with their contemporary GE Dash 9s or AC4400s. Aside from the less obvious technical aspects of the prototype SP SD70M having DC traction motors vs. the SD70MAC having inverters & AC traction motors, there are some physical outward differences. The more noticeable differences on the MAC version are the extra small rectangular or square grilles placed below the rear radiator section and front dynamic brake areas on both sides of the loco - 4 locations. Moreover, the MAC version does not have a boxed step structure on top of the catwalk that the M version would have as located behind the left side of the cab (area depicted at catwalk of above picture). Also, the hand rails on the nose of the MAC are anchored high up, whereas the M handrails on the SP SD70s are placed (end at) about the same height as the front railing. This makes it easy to identify the MAC from the M version when looking at the loco head on. That said, it is to be appreciated for road names other than SP, some of the M versions have the high anchored hand rails like the MACs. Another difference is the blower housing situated near the turbocharger of the loco - though located on the left side of the car body. For the MAC version, it has exposed exhaust side vents that protrude more toward the catwalk outer floor area (below picture) whereas the M version is more flush mounted and appears to exhaust out of view under the catwalk floor. I suspect there are other difference and will leave such detail to be determined by those folks so interested. For those skilled in modeling detail changes, the differences could be remedied. The SP SD70 is described and shown on pages 35, & 122 - 127. Additional SD70 pictures are on pages 39, 44, 48, 144, & 158. Finally, it should be appreciated that later prototypical model SD70s adopted flared radiators along with other alterations, but the USAT replica is of the early SD70MAC having the flush mounted radiators. As such, the USAT SD70MAC that have been decorated in the Union Pacific "Heritage" livery of many of its subsumed railroads is not strictly authentic since these locos have the flared radiators and other changes. The SD70 versions having the Heritage livery are of the newer SD70ACe model version. This is not meant to be a criticism of USAT, but one should be aware of this for those that have a preference to model for exactness. To this end, knowing that the MAC version is not exact for SP, I chose to purchase the USAT SD70 in Southern Pacific gray livery, road number 9813 (since followed with a second purchase in road number 9812). Out of the box the SD70 weighs about 10.5 lbs. The motor blocks include a clever design with a separate pivoting (floppy) front axle / housing - apparently facilitating better loco operation on tighter curve tracks. However, the floppy axle exhibits minimal downward loading to the rail head; thus, its traction contribution would seem to be minimal. The USAT 3 axle truck assembly has its pivot point offset toward the fuel tank. The pivot point is located between the two fixed axles as shown below along with the electrical pickup shoes. Also, note the electrical wires protrude out of the back of the motor block toward the fuel tank as they are routed through the under frame. Shown below is the comparable (virtually same) size of the USAT SD70 and Aristo Dash 9 with slight difference in belly overhang when placed on 8 foot diameter curve track. Shown below is the USAT SD70 with its inboard offset pivot centered trucks that measure approx. 16 3/4 inches apart. For comparison, shown below is the Aristo GE Dash 9 with its outboard offset pivot centered trucks that measure approx. 20 1/4 inches apart. So why did USAT design a 3 axle truck with such a clever floppy axle to enhanced curve track operation and then mount it to the loco frame with an offset pivot location that tends to diminish curve operation when the loco is coupled to a car? A contradiction! To speculate, perhaps when traction tires had been used on the wheels of the axle located at the fixed section of the motor block nearest the fuel tank, it may have been determined to have best enhanced traction - OR maybe it was determined if the traction tires were placed on the axle nearest the pilot ends of the loco there was some discovered operational detriment. (Of course, mounting traction tires to the floppy axle makes less sense since the floppy axle has much less downward load being it is spring loaded.) Then, too, maybe USAT was more concerned with how the loco looks when going around tight curves, and they favored less belly overhang as being a more favorable aesthetic trade-off. To that end (with unknown difficulty) it does appear that one could remount the trucks 180 degrees - though the motor block electrical wire connections would then seem to interfere with coupler apparatus at the pilot ends of the loco. Nearly all my trains are Aristo-Craft brand, and thus, the Aristo knuckle couplers predominate. (The few exceptions include several AML cars and a couple of USAT container / well cars). This presents a dilemma as to what to retrofit to the USAT SD70 as the USAT knuckle couplers that the loco comes standard with are incompatible with coupling to the Aristo couplers - mostly due to their height differences. Given this, I decided to try and experiment with Kadee couplers as they will physically couple with Aristo's knuckle couplers. My initial thought and intent was to equip non Aristo locos with Kadees and retrofit any Aristo locos or cars with them should the Aristo couplers exhibit the pull apart syndrome; thus, mixing & matching Aristo & Kadee couplers on an as need basis. (To indiscriminately retrofit all of my trains with Kadees - approx. 350 items - would be prohibitively expensive as well as too time consuming to do so - particularly if body mounting.) But I soon discovered and realized this was not a straight forward matter. The problem is what coupler height should be used when retrofitting the Kadees! Different folks may confront this by choosing different coupler heights based on their own operational considerations or preferences. I purchased the Kadee #880 gauge and decided to use this as a reference to establish a standard height. Doing so will yield a virtually scaled prototypical rail top to coupler centerline height distance whilst assuring the emulated Kadee hose (aka Kadee "trip pin") won't snag on the track work, including turnout frogs, if the coupler were otherwise mounted too low. Moreover, adhering to this height as a standard would best accommodate the use of the magnetic and delayed uncoupling features as intended by Kadee design as well as allowing interchange of rolling stock with other folks layouts. Note: If one chooses NOT to conform to the Kadee 880 height gauge so as to have a Kadee coupler vertically align with a Knuckle coupler typical of an Aristo freight car, then mounting a Kadee centerset type 789 coupler box assembly upside down with a custom made spring retainer (described later) placed between the box tang and loco pedestal mount can be done. However, the emulated hose would have to be trimmed short or bent upward to provide clearance so it would not get caught in the track work. Shown below is how excessive the USAT SD70 factory installed standard knuckle coupler is placed - being way too low to rail head! A total mismatch. Shown below is how far off the Aristo-Craft factory installed standard knuckle coupler is on their Barber type freight truck. At least it will partially encompass the Kadee coupler. The Kadee #880 gauge shows the USAT factory coupler height is so far off as to be unusable (even if the USAT coupler would latch to a Kadee or Aristo coupler), and the Aristo-Craft coupler only partially mates with the Kadee coupler. Even this amount of vertical offset can't be tolerated for train operation as the coupler would surely ride up and become detached with any kind of moderate draw bar load. It's worth pointing out Aristo's coupler design includes an anti ride up feature - being that small chin plate located at the very bottom of the mouth of the coupler. This clever feature, no doubt, allows their own couplers to mate with differing Aristo rolling stock coupler heights - particularly of value for truck mount couplers as the long tang in which couplers are mounted and projected from tends to amplify any imperfections as to coupler height. Shown below is how well the USAT SD70 front & rear retrofitted Kadee 787s (once modified) line up to the Kadee 880 gauge. It is to be appreciated that if one desires to pull cars having truck mounted couplers with SD70 body mount Kadee couplers on certain curve track diameters (including of 10 foot diameter), the coupler boxes must be allowed to swing - otherwise the lead axle of the car coupled to the loco will be forced to derail. This condition is aggravated by the USAT offset truck pivot design as previously discussed. Generally, Kadee appears to offer four G scale coupler styles, all having the same knuckle design, but with different vertical offsets (or no offset) with respect to their mounting / shank ends. The Kadee "centerset" couplers have no offsets and are offered in two version with one having a long, extended shank. This type is used in the Kadee #830 product and newer #906. The offset couplers are offered in two versions with one having a "medium offset" and the other having a "large offset". These couplers only have an upward vertical offset. The couplers are then housed in several different draft gear box styles with the ones most applicable for the SD70 being the short gear box or the truck mount gear box. So basically, Kadee (or a customer) can mix & match various coupler offset types and draft gear box styles that may be best for a given product application. For the USAT SD70, Kadee recommends three possible coupler assemblies, with two intended for fixed mounting and the other to allow for a swinging coupler with draft gear box assembly. These are the Kadee #836, #831, and #787 representative of the older styles. The recommended fixed mount #836 consists of a medium vertical offset coupler housed in a short case draft gear box. This type is intended to be used in conjunction with the USAT knuckle coupler pedestal that comes mounted standard with the SD70. Because the Kadee #836 uses the short case, this will not work if installing the snow plow on the front of the SD70 as the coupler will not project far enough forward. Thus, Kadee recommends using the #787 that includes a truck mount type case style - but meant to be fixed mounted on the SD70. Shown below is an under side view of the Kadee #836 mounted on the rear of the SD70. The recommended #831 consists of a large vertical offset coupler housed in a truck mount type gear box, but instead of it being mounted on the tang of a truck, it is intended to be used in conjunction with the USAT optional pedestal meant for the hook & loop couplers. (USAT includes this type pedestal within the SD70 packaging.) This type pedestal incorporates a swinging arm and is used in concert with a unique 2 prong centering spring. Thus, a truck mount coupler box when mounted on this pedestal type will be allowed to swing from side to side - a necessary feature when coupling to truck mount coupler type cars when operated on tight curves. What became apparent to me with this arrangement was the "looseness" of how it all fit together with so many parts, and the physics of using a large vertical offset coupler would suggest it to be problematic under heavy load conditions. Besides - it just looks plain ungainly, too! Shown below is a mockup of this arrangement. Note that Kadee recommends cutting off the pedestal's round "nub" on the end of its "T" to facilitate mounting the coupler box so it will not project out as far, but if operation on 8 foot diameter track is the goal, I think it wise to not do this until you try it the way it is first. (1) The first choice is to use the older Kadee #787 couplers implemented as swinging box couplers. Since these couplers are medium offset types, they do not require cutting modifications to the pilot of the loco. (2) The second choice is to use the newer Kadee AAR "E" type centerset coupler if willing to perform some minor modifications to the loco. This choice utilizes the newer coupler with parts from the Kadee 907 kit in a uniquely designed swinging box. The box is available as a 3-D printed component along with other supporting components. The illustration below shows a much more aesthetically pleasing SD70 equipped with the 3-D printed components. For this newer coupler choice, skip to Appendix H, The Ultimate Coupler Solution. The Kadee #787s are mounted on standard factory USAT knuckle coupler pedestals. By installing the couplers first, there is less risk of damaging the remaining detail parts such as the pilot end parts & railings - so it is best to install such parts after doing the coupler installations. What I did was to use the Kadee #787 coupler assembly on both ends of the loco, but with each mounted differently and with different box modifications for each end. I also fabricated a metal centering spring retainer having "ears" for the purpose of utilizing the SD70 coupler centering spring normally installed & intended for the hook & loop swinging pedestal type mount. Once the ridges were removed with a fine tooth hobby saw, I filed the surface smooth. To allow for a bit more side to side swing, I also angle notched the upper corners of the coupler box near the lid. Note that the centering spring retainer design shown above will / can also be used on the rear coupler when turned around 180 degrees as / though its "T" leg is not required for the rear coupler installation. Accordingly, I found it best to do the front coupler first in the event the retainer were not snug fitting as it must be. If loose fitting on the front coupler box, it then can "salvaged" for use on the rear coupler. As per Kadee recommendation, a #43 drill and tap for 4-40 NC thread size is used to prepare the SD70 pedestals for accepting 4-40 x 3/4 inch long pan head screws used to mount the draft gear boxes. Shown below is a back view of the standard SD70 pedestal with the Kadee #787 mounted to swing with fabricated spring retainer. Note the nylon self locking nut that will help assure the screw from backing out due to the swinging action of the draft gear box. The below picture shows the SD70 installed modified #787 front coupler assembly with its fabricated spring retainer. The retainer "T" leg tang must be fabricated to fit snug against the backside of the plastic box to impart the best spring return effect; otherwise, the coupler box will not fully return to a center position once installed with its centering spring. Note: It's best to trim the "T" leg tang with a file to assure a snug fit. If removing too much material results in a loose fit, this centering spring retainer can salvaged for use on the rear coupler box if turned around 180 degrees since the rear box will not require the "T" leg. One of the angle notched upper corners of the couple box can be seen in the below picture. This allows for a bit more couple box side to side swing before resting against the pilot. The below picture shows good installation alignment with the Kadee height gauge. Shown below is the Kadee 787 front coupler assembly as modified & installed on the SD70. Its swinging box arrangement allows operation on tight diameter curves. Note that the front snow plow knock out plug is left out to allow for the coupler assembly to swing without interference. It appears possible to trim the knock out plug to accommodate the swinging coupler box if one were to spend time doing so - albeit with delicacy, including for its re-installation. The #787 coupler box meant for the rear mounting was only slightly modified. The back end of the tang was beveled with a file to avoid the swinging (floppy) truck from interfering. The pivot point used is where the large recess is located in the tang - it being closest to the coupler / box end of the housing. Using this location allows for a bit more coupler projection than afforded by the Kadee #836 box. However, this location is apparently meant to nestle the nub of a USAT mount like the one on their swinging pedestal and not intended as a pivot point. That said, I drilled a hole in the center of the recess to accept a 4-40 x 3/4 inch pan head screw. As can be seen in the below pictures, I placed a nylon self locking nut within the recess - threaded down on the screw. Under the nut is a washer that snugly fit since the thickness of the plastic in this area (measured .070 inch) is less than the rest of the tang (measured .170 inch) - thus adding strength in consideration of draw bar forces. The other side of the tang includes a fabricated metal centering spring retainer, too. When fastening the whole assembly, the freely moving screw & nylon lock nut is tightened down on the pedestal only enough to allow for a degree of clearance so the that the assembly will freely pivot yet not be too loose. As done with the front coupler box, the mounting screw is longer than needed so that a jamb nut (or nylon self locking nut) can be installed on the underside of the pedestal should there be a tendency for it to back out during train operation. The SP road number 9813 SD70 Kadee box for its front coupler had to have its ridges trimmed to allow for sufficient room for proper railhead to coupler height whereas its rear coupler did not. However, SP road number 9812 as received had a very subtle downward bend or warp in its rear pilot area - enough so that it caused the coupler to somewhat point down with its height to be lower than acceptable. Before I realized this, I had installed the rear coupler with the same modifications and in the same way as road number 9813 - only to later discover when the loco was operating on the layout its coupler's emulated hanging brake hose would get stuck on the Aristo rerailers - causing the coupler to bend downward even more. One time the forces were great enough to have provoked an uncoupling! Though one can make a valid argument that Aristo's rerailer has its plastic ramp too high being above its railhead, this does illustrate the importance of conforming to the Kadee 880 gauge height requirement. Shown in the below pictures are the modifications made to the rear coupler for this particular problem loco. A surface slice was made to remove the ridges and beyond. Angles are to accommodate swinging of the box. Shown below is the completed modification. Cleanup can be done with a file. Shown below includes the mounting of the spring retainer plate. The purpose of "V" angle can be seen in the below picture with the modified Kadee 787 box mounted on the rear of the SD70. Shown is the swinging coupler box centered by its spring. Note the box can swing left and right. As shown below, the modified coupler box coupler now aligns with the Kadee 880 gauge. I did not use any glue on the detail parts when fastening them. The holes for the pilot end parts allowed for a snug, friction fit. It became evident that this was indeed welcomed - particularly when installing the the Cut Lever (coupler lift bar) wire rod with its 4 tiny holder eyelets. Should the need ever arise to better secure the parts, it is best to put a dab of glue from the back side of the pilot ends where the part pins poke through after they are installed. If you attempt to put glue on the part pins whilst installing them, there is a high risk of making a mess of it as it is likely you will end up smearing glue all over the front of the pilot in the process. Alternatively, if you attempt to pre-glue in the pilot end holes in which the parts would be installed, it's possible the glue may set up too fast by the time you get the parts aligned - at least until you get the hang of doing it. The rear pilot can be done first as it is the easiest to do. The front pilot adds the plow. The first items I installed were the "U" shaped metal grab irons (4 can be seen on the rear pilot near the top and bottom ends of the air hoses.) I was able to push them into their corresponding holes using my thumbs whilst supporting the back side of the pilot. The second items I installed on the pilot ends of the SD70 were the black plastic hoses that are molded in groups of 3 hoses each. Once their mounting pins were position with respect to the corresponding holes, I used a plastic mallet buffered with a wood dowel pin to drive them home. According to the USAT SD70 Owners Manual booklet there are right and left hose assemblies and they differ with respect to their bottom ends; however, this manual did not show or describe which should be mounted where. I discovered this after I assembled the first SD70, road number 9813. Having found a picture in an SP book, it does not appear there are right and left hose assemblies having differently oriented ends. The picture above shows an SP SD70 having air hoses with a white dot. Perhaps this is to identify to a crewman or brakeman if a hose is twisted. When observing the right side of the plow for the hose nearest the coupler, note the orientation of its bottom end (that resemble a hand with a thumb) that appears opposite to that of the other hoses - and a white dot is not visible on this hose. So I decided to leave the hoses as I installed them, rationalizing they could emulate being twisted - albeit in groups of three. The third item I installed was the Cut Lever (coupler lift bar) wire rod with its 4 tiny eyelet rings that serve to hold the rod to the loco's pilot end. This was the most difficult part to install on the loco. With the loco placed on its wheels and its pilot end positioned at the edge of a table / work bench, the technique I used was to first preposition the four eyelets rings on the rod to their approx. locations by sliding them along the rod. I then proceeded to start at the far end of the rod, using my thumb as best I could to swivel an eyelet into position of its intended pilot end hole whilst holding the rod with the rest of my fingers and other hand. I was able to start the eyelet into its corresponding hole using my thumb, then finished driving it home using a plastic mallet and wood dowel pin as a buffer. I proceeded one by one until all 4 eyelets were installed. (Caution: Use very little striking force with the mallet or risk breakage of the eyelet ring as I had experience with one during assembly of my second SD70, road number 9812. In this regard, it is advisable to properly orient the eyelet as best as you can before using the mallet.) Note: Should eyelets prove to be too problematic, fragile & break, see Appendix D, Cut Lever Eyelet Fix by Substitution. The fourth item I installed was the front pilot plow - but without its knockout so that the coupler box is free to swing from side to side. (It's possible to notch the upper part on either side of the knockout to accommodate much of the coupler box swing, but I chose just to not use it.) To install the plow, I first pried the extended ends of the black hoses away from the pilot whilst slipping the openings of the plow past them. Once the plow was positioned, I used my thumbs to push at corners of the plow near where the paired pins / holes are located on the pilot whilst supporting the back side of the pilot. The fifth & last item I installed was the large single air hose. Once this air hose is positioned and started in its pilot end hole using hand and fingers, I found using the closed ends of a small pair of long nose pliers was convenient to push on base of the hose at the hole area until it was fully seated. The SD70 pre painted side railings as supplied by USAT have to be installed by the purchaser. The railings fit into the loco so loosely that they will fall out! The stanchion tabs had to be opened up using an Xacto knife in order for the railings to stay put. The side railings are then placed along the side of the loco with the stanchions' tabs pressed in using the thumb. A plastic mallet can be used to do the final seating. I was surprised how easy the railings were to install compared to Aristo's SD45 loco. The front and rear pilot end railing assemblies are the same. Unlike the side railings, I found the end railings to be too tight when attempting to install them - so I scraped some paint away from the tabs using an Xacto knife. I found using a pair of long nose pliers very helpful to start the installation of the railings at the tab ends by applying some downward force. The final seating of stanchions is done with a plastic mallet with a light tap. As shown in the below picture, the end of the hand rail can be coaxed into its hole by the step area using long nose pliers as necessitated by the confined space due to the plow. The nose hand railings were installed without difficulty, though I did use the plastic mallet with a wood dowel as a buffer to seat the ends into their respective holes. This proved to be configuration for best results. Aristo couplers on their locos appear to vary greatly as to how horizontally straight they project out. A best case coupler alignment example is shown below with the USAT SP SD70 fitted with Kadee 787s on the left coupled "Elephant style" with an Aristo UP Dash 9 on the right. This is not always consistent when coupling to other Aristo locos or even to the opposite ends of the same Aristo loco as shown below with the locos now coupled back to back. It may be desirable that Aristo coupler shanks are deliberately loose to facilitate coupling to their own cars having truck mount couplers that are somewhat lower. However, sagging Aristo coupler shanks do not make for accommodating coupling to Kadee couplers set up for the proper distance from the rail head as was done with the retrofitted USAT SD70 here. Shown below is a more disconcerting result with the SD70 Kadee rear coupler riding up much higher up on the Dash 9 front coupler of the trailing Dash 9 loco. Though a centerset Kadee coupler here would also appear to be better, the amount of offset would still seem to be disconcerting. Shown below is a two unit lash up with the USAT SD70 in front of the Aristo GE Dash 9. Shown below is a close up view of the couplers with the two unit lash up - still disconcerting. That said, in spite of these mismatches, the 3 six axle locos did not separate from one-another with a one test run around my under house layout. But that's all I was willing to do with them! What is most disconcerting is the subjective feel of how these locos operated together in that I would not want to operate them at any length of time like this - owing to way they sounded and subjective "feel" as to how they operate together. In contrast, when I had done a speed mismatch test using two Aristo U25Bs (faster four axle locos) with an Aristo SD45 (slower six axle loco) - they subjectively operated very well together, so much so that I would have no concern doing this for a prolonged time with a train load behind them. The USAT SD70 with Kadee 787 couplers modified for swinging boxes appear to work on an 8 foot diameter curve track. Except for 8 foot diameter curve track accessing my rail yard area, my under house layout consists primarily of 10 foot diameter curves for its main line. An 8 foot diameter track was placed on the floor for worst case evaluation of coupling two SD70 locos and a car together. Illustrated below is the extent to which the SD70 front pilot and coupler project beyond the outside rail of the 8 foot diameter curve track! The below pictures show two USAT SD70s placed back to back on an 8 foot diameter curve track having passive coupling tension. This picture shows relaxed coupling tension between the two. Putting tension on the car actually improves both car and loco couplers' engagement action. Inside view on curve shown below. Note that the Aristo SP box car example should ideally have its Kadee 830 coupler assembly mounted about .040" higher up as per Kadee 880 reference gauge. A test train was setup to include 35 cars. The train is not prototypical as it includes mostly ice bunker refrigerator cars - too old of an era and long gone when the SD70s came to fruition, but I happen to have that train out on the layout. The SP SD70s (nos. 9812 & 9813) were setup back to back with the SP double door box car serving as a transition car since it has a body mount Kadee 830 on one end and Aristo knuckle coupler on the opposite end being coupled to the rest of the all Aristo train set. I discovered a few peculiar issues when operating the train around my under house layout. The front pilot plow projected overhang is so excessive it will knock off the lantern and strike the control arm on the Aristo Wide Radius turnout! Once the lantern is out of the way, the control arm is struck! The switch stand could be moved to the opposite, inboard side to avoid this. Shown below is an overhead view of an SD70 rear pilot end with its modified Kadee 787 swinging box coupler coupled to the box car with body mount Kadee 830. This is on 8 foot diameter curve track that connects to my rail yard. A car with a truck mount Aristo knuckle coupler will separate from the same loco's Kadee coupler on 8 foot diameter track like this - though it seems to stay coupled in 10 foot diameter curve track. Shown below is an overhead view on a 10 foot diameter curve on my layout's main line. Shown below is the outside view on the curve. Shown below is the same test train, however now coupled to an Aristo BC Rail EVANS 53 foot box car with its Kadee 830 coupler assembly installed in a projected attitude representative of a prototypically correct"cushion underfarme" that such a car would have. Compared to the Katy car, it can be seen that the coupler shank straightness is further improved as a result of the additional projection. This further enhances operation on curves. However, either car performed flawlessly during the train operation around all the curves on the layout. Shown below is an SD70 loco coupled to an Aristo 40 foot reefer car with standard truck mounted Aristo Knuckle coupler. Due to the SD70 Kadee coupler height mismatch with respect to the Aristo coupler, and in the interest of fairness, I could only judge operation using light loads with about 4 cars max. Though I did not observe car derailing under these less stressing circumstances, I thought it best to judge heavy loading using a Kadee truck mount installation. Shown below is an SD70 loco coupled to an Aristo 100 ton hopper car with a truck mounted Kadee 789 having a centerset / straight shank coupler. This proved to be problematic. When the test train was made up to about 17 cars on my layout it managed to work; however, when the train was loaded with more cars, the 100 ton hopper would derail on the 10 foot diameter curves as shown below! Shown below is the top view of the same derailed 100 ton hopper. Note how the coupler shank is now in a straight ahead position similar to that of the test train having the BC rail EVANS car - but of course that car did not derail since it had a body mount coupler with the best desired coupler shank attitude during train operation. In order to minimize the chances of derailing a coupled car having a truck mount coupler to a loco with a body mount coupler - even with a swinging box - it appears that the loco's coupler shank will have to be longer than the Kadee 787 used on these SD70s. In this regard, it is possible that a Kadee 832 long shank coupler box could be adapted for use with the medium offset coupler from the Kadee 787 box like that used in SD70s described here. But I did not try this. At this point I decided that the body mount coupler methods proved so superior in operational performance, that this is the best way for the future. Moreover, such further compromises would also detract from the aesthetic appearance. Shown below are the two SP back to back SD70 locos with road number 9813 on the left and 9812 on the right. As previously described, the rear coupler box on 9812 had to modified differently due to its rear pilot having a slight downward warpage. The alignment action of the couplers can be seen. The custom made spring retainer plate can be seen on the left for SP # 9813 loco. This allows for the swinging box to return to a center post ion - desirable when backing up the loco to couple to a car. The custom made spring retainer plate can be seen on the right for SP # 9812 loco. Note that the bent "U" shaped two prong spring acts as two wires having tension like miniature torsion bars - with each wire passing through near either end of the plate. The overall effect is push - pull as the coupler assembly pivots and returns to its center position. Shown below is a bird's eye view of lead unit SP #9813 front pilot area showing the pedestal mount, Kadee 787 box tang and spring retainer plate. Shown below is a head on view of the USAT SD70 plow interfering with the Aristo Wide Radius turnout control stand - both lantern and control arm. This happens whilst the loco is rounding the curve path. (A simple solution is to place the control stand on the opposite side of the turnout.) Note: Missing door window is discussed in Appendix B. The Aristo GE Dash 9 loco shown below does not interfere with the control stand. These views clearly show the ill effects of pilot overhang. I typically operate a train with at least two locos and more than 30 cars. The power to the test train was supplied via an Aristo Train Engineer with 10 amp track side receiver set to pulse width control mode. I found the two USAT SD70s to perform smoothly pulling a 35 car test train, including at an impressive crawl speed. The loco pair typically draw about 2 amps at a moderate speed setting. The flashing ditch light feature of the SD70 would only work at a speed near stop or with the train powered such that it just stopped. When the Train Engineer was set to "Linear" mode, the ditch lights worked the same way. Aristo-Craft couplers work to the extent they do because of their oversize design that also includes a clever chin plate feature that limits ride up and separation when subject to height mismatches, track work irregularities, etc. Aristo locos typically may have long shank, loosely mounted coupler arrangements allowing vertical displacement for coupling to lower height / more rigidly mounted truck couplers. (In fact, I have found this technique allowed mating AML cars having AML knuckle coupler truck mounts to Aristo knuckle coupler locos & cars, too.) However, over time, Aristo couplers have suffered from performance inconsistencies from different factory production runs. It has been my experience that very old production run couplers would not couple together well - requiring slamming cars together - and the couplers, once closed, would tend to unlatch when subject to moderate loads. Whilst some folks have analyzed these couplers of past times and performed repairs, this still did not alleviate other deficiencies. Later factory production run couplers had improved, but they then suffered from physically pulling apart (not unlatching) under heavy loads with the more recent production runs retrograding to pulling apart under moderate loads. (e.g. as experienced with Aristo's GP40s). Folks in past times may not have pulled a train with too many cars with their loco/s, and the "toy era" of past times may have furthered the expectation of small size trains, too, but the hobby has now evolved to the level of many folks, like myself, that desire to operate realistic looking long trains. As a result, folks modeling longer trains of today are now experience couplers having inadequate design capabilities suffering from performance issues that may not have been anticipated. Its obvious the "G" scale manufactures have recognized the acceptance of longer trains and now produce cars that encourage the hobbyist to acquired them in quantities for making up unit trains (e.g. Aristo 100 ton hoppers and more recent 2 bay 33 foot hoppers) - a deliberate strategy to the benefit of increased sales. But for folks, like myself, that have notable quantities of Aristo products, the Aristo coupler is not up to the job of accommodating the loads imposed by such trains - particularly important on layouts that include many curves - even 10 footers - as curves impose added drag with respect to rolling performance. Since reliance on Aristo's technique of matching irregular coupler heights cannot be done with Kadees, a reference height must be adopted. Whilst a Kadee coupler could be chosen for a vertical match up with Aristo truck mount couplers, the lower than intended height application results in the trip pin (metal emulated brake hose) interfering with the track work. Bending it can be done, but doing so on a large quantity basis is undesirable, and cutting it off negates the Kadee uncoupling features. My original intent was to use Kadee couplers on new non Aristo products (like the SD70) and replace errant Aristo knuckle couplers on an as need basis, but I realized as time went on I would likely have a large investment in new couplers, and if I chose a Kadee product for a non standard height only to later discover with regret it best to conform with a publicly recognized standard & prototypical height (conforming to the Kadee 880 gauge) I would risk ending up changing to another Kadee coupler assembly at additional cost and time. Acquiring the USAT SD70s necessitated changing their couplers no matter what (in this case to Kadee model 787 - albeit with mounting alterations) in order to facilitate their use with my mostly Aristo rolling stock as exemplified with the test train. As to the chosen Kadee 787 coupler with the modifications previously described, the SD70 successfully operated on 8 foot diameter (or greater) curve track when coupled to a train with the first car having a body mount coupler. It did NOT work when coupled to a car with a truck mount coupler on 8 foot diameter curve track and marginally worked (load dependant) on 10 foot diameter track curves. Since my test train test car having a Kadee coupler retrofitted to an Aristo truck mount proved less than satisfactory - even being at the standard height - retrofitting (or fitting) rolling stock to body mount couplers is best to do. To this end, it becomes an imperative to adopt the Kadee standard height, and this is what I have chosen to do and will be using Kadee couplers. Additionally, a conversion car/s with a Kadee body mount coupler on one end to mate with a loco and an Aristo truck mount Knuckle coupler on the other end to attached to the rest of the train will suffice for the short term. Long term wise, it appears that over a prolonged, periodic time period to convert selected groups of rolling stock and Aristo locos to the Kadee couplers (starting with the ones having the most problematic Aristo couplers) will be a viable strategy. During operation on the outdoor layout with dynamic forces at play pulling a 90 pound heavy train, the rear Kadee coupler "hose" on the trailing unit (with two SD70s coupled back-to-back) could get caught in an Aristo-Craft rerailer. Sometimes this would cause the lead unit to uncouple and the trailing unit's "floppy axle" to derail. The remedy was to rebend an upward curve at the tip of Kadee coupler hose. SD70, road no. 9812 unit, was received with no front window in its nose door. The window was apparently knocked out during the rigors of shipping - later found lodged within the nose of the unit. The door was opened to extract the loose window after which the window was installed in the door. The window and corresponding opening in the door are both "beveled" so the window fits only one way. With later USA Trains production runs of SD70s having no traction tires (desirable in my opinion) the units can have pulling ability increased by adding a small amount of extra weight in conjunction with improved axle lubrication. The factory weight of the SD70 measures about 10 & 3/4 pounds. Adding extra weight improves traction while retaining wheel slip failsafe should the loco be loaded too much. (The loco must not have traction tires). Extra weight can be placed in the fuel tank for best low center of gravity. I had some 1/2 inch diameter Rebar tailings left over from home foundation repair work. Since I don't use sound, (hence. no speaker in the fuel tank) I placed the weights where the speaker would be. That said, if using sound and fuel tank speaker, weights could be split up and placed near the ends of the tank while keeping the speaker in the middle. Shown below is what's involved when fitting the SD70 with weights placed in the fuel tank. The SD70 overall weight now measures 13.1 pounds as shown below. Lubrication should be improved in light of adding about 20 percent more weight to the SD70. I chose to use Automotive Moly Paste on the axles which appears to be thicker than oil but thinner than grease. Note: The side frame bushings where the axle tips penetrate are used for electrical pickup and support the Loco's weight along with the axle bushings. So called conductive lube is typically specified for use here; however, such conductive lube like recommended by USAT is typically in the megohm range or greater, thereby, of no benefit when operational currents can be in whole ampere values. The SD70 coupler Cut Lever (coupler lift bar) that is located on the front and rear loco pilots is retained by 4 small, delicate, plastic eyelets that are slid over its rod. The eyelets press into holes in the pilot. They can be easily broken during assembly or when working on the loco. Note: If pilot holes are plugged with broken eyelet pegs, they can be removed by punching them out via paper clip wire. If they were glued in, then a pin vise with very small drill bit will be needed to drill out the pegs. The little plastic eyelets are not separately available as spare parts, so the whole Cut Lever (SD70 "coupler lift bar", part no. R22-634) that includes them would have to be purchased. Note: If replacing a single eyelet, the substitute paper clip loop could instead be bent to a "J" pattern so it can hook directly over the cut lever rod. Should circumstances necessitate separating the body shell from the chassis, the illustrations to follow depict fastener locations from which a Phillips P1, long but narrow neck, screw driver can be inserted within recesses in the chassis to remove screws. Additionally, a smaller Phillips #00 point screw driver can be used to remove two tiny screws that help retain the loco's cab to the chassis. Re-installation of the body shell is the reverse of removal. Note: Nose Grabs are what USA Trains refers to as "Body Rails, Front", part no. R22-632. Illustrated below is an overall view for the fastener locations on the loco. Depending on factory production consistency, the rear of the SD70 long hood body shell may not fully seat on the rear most part of the chassis. The chassis is somewhat flexible and relies on a well seated body shell to keep it straight; however, the fastener location at the rear of the chassis is too distant to keep the chassis straight should the chassis have some deformity during the molding process. On an occasion when lifting up one of my SD70s from the track, its rear truck came detached from the chassis as it precariously dangled from its floppy axle! This could have happen to a front truck, too, since the factory does not appear to utilize some kind of thread locking means to retain the screw that fastens the truck. The SD70 trucks are factory fastened to the chassis with a screw passing through a fender type washer, then through a metal bushing where minimal threads engage into the truck's steel "A" frame ("truck mounting block", part no. R22-636). Note: USA Trains does not list spare parts for the screw, washer, and bushing. Needless to say, removal of the body shell had to be done to gain access to the interior of the loco to "fish out" the parts and refasten the truck. A thread locker was used on the screw tip during reinstallation. This solution is based on installing 3-D printed components that includes swinging coupler boxes, mounting pedestals, plug for rear pilot opening, and draft gear fairings for front & rear pilots. The coupler box is an accessory that accepts the Kadee 907 kit's centerset coupler, springs, and lid. The 3-D components for this application (and others) are designed by me (Ted Doskaris) in conjunction with Colin Camarillo who has the 3-D printer, along with supporting apparatus & software etc. expertise, to implement the designs. If interested in acquiring a 3-D component kit, see Colin's Web site CamPac BoxTM page. Shown below is an SD70 that has slight modifications that accommodate the components (widened center plug on snowplow & plug for filling factory pilot cutout). To be shown later are notches done to front and rear pilots to accept swinging coupler box with center set coupler. The swinging box allows operation down to 8 foot diameter curve track when coupled to other rolling stock with body mounted couplers - shown below. Note: Truck mount couplers are not compatible on tight curves due to their inherent contrary characteristics - e.g. coupled car to loco can derail. Note: Layouts with "S" bends must have a straight track section the length of an SD70 or greater between opposite diverging paths. 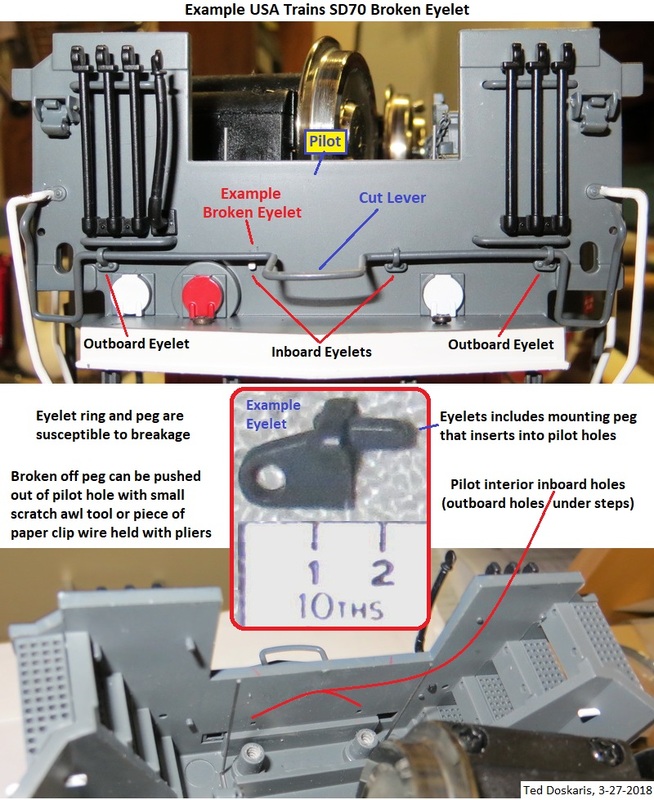 Illustrated below are details to pay attention to with respect to the coupler box & pedestal. Caution: Do not use the Kadee self threading screws to fasten the lid because they may risk splitting. Use #2-56 machine screws in which the CamPac BoxTM is pre-threaded to accept. Note: The Kadee coupler box lid is installed on the underside of the box with two screws. Adding the rear screw helps strengthen the assembly for heavier load operation on a layout. The rear screw hole in the lid is to be countersunk so that the screw's flat head is flush with the surface of the lid so when the box is mounted in the rear of the loco, it will not interfere with the pilot plug. It's advisable to pre-lubricate the pivotal surfaces of the box and pedestal. An example lubricant kit is shown below. It was not too much more in cost compared to purchasing a couple of individual items. I used the Dry Graphite with Moly when burnishing-in the pivotal contact surfaces. Note: The reason for the pre-bent coupler trip pin is to preclude the possibility of it getting stuck in an Aristo-Craft re-railer placed in a curve that I have on my layout. This was done because of the SD70's long length (exacerbated by its large end overhang due to the trucks' inboard pivot center) which is the reason this loco is fitted with swinging coupler boxes for operation on tight curves. Modifications to the loco are done in the same way for both pilot ends to accommodate swinging coupler boxes with centerset couplers. The illustration below includes dimensions of the cutout area. Note: It's best to screw down the pedestal base to make sure it's seated all the way. The coupler box is to be adjusted to freely swing, yet not be so loose as to hang down when with the loco is on the track. The pilot plug is intended to fill that gaping factory opening in the rear pilot after the coupler box is installed. The opening in the front is the same as the rear, but it is hidden after the snowplow is installed. That said, obtaining an additional plug could be used in the front if so desired. Note: Friction fitting the plug in the pilot opening is normally sufficient to retain it; however, if glued in place, and should the need arise to remove the coupler box, it will difficult to extract the box's wings from the centering spring wires, in which case the centering spring may have to be unfastened from the chassis and pulled out from under the wings. The snowplow consists of two parts: The main plow with large center void and the plug (aka, knock out) that can be snapped into the main plow from its backside. The reason for the knock out plug is to accommodate the USA Trains hook & loop or possibly their optional low mount swinging knuckle coupler assembly designed to work with rolling stock having truck mount couplers for operation on tight curves. The fairing is that small triangular shaped part that serves to flare in the draft gear (coupler box) to the pilot face on front and rear of the loco. The factory SD70 does not have this detail part, so adding the fairing gives the loco a more prototypical appearance. Note the prototype plow opening surrounding the coupler has more of a flared upward cutout area at the top, whereas, the USAT SD70 modified plow is pincered at the top. If so desired, the plow could be modified like that, too, but if done, it may be desired to obtain another pilot plug to better hide the area behind the plow that would become in view. With modifications and 3-D components installed, the loco weight is shown below. The measured weight is virtually the same as it was when equipped with its former Kadee 787 offset couplers.